Ideal for liquid level detection in locations where you do not want to insert a sensor electrode deeply into a small tank or plumbing. Sensor electrode insertion length in a tank can be adjusted. The sensor electrode is designed to limit the minimum the electrode insertion length and to prevent mechanical interference with a tank’s shape and liquid flow. The electrode length can be adjusted if the electrode is submerged in the material by liquid flowing in a tank, or the material adheres to the tank wall. Employment of the latest technology allows the products to provide high sensitivity, high precision, stable detection, and compactness. Can be used in harsh conditions such as high and low temperatures and high pressures, vacuum, vibration, and static electricity. Equipped with various functions including a variable voltage power supply (20V to 250V AC/DC), a delay function and a fail-safe function. Electrode length can be adjusted. Detect presence/absence of liquid (detects level and empty). 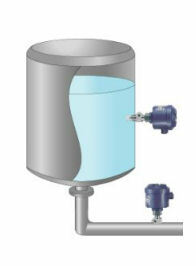 Ideal for detecting liquids in a small tank, small equipment, in pipes. * Intrinsically safe explosion-proof sensors are also available (intrinsically safe standard Exia II BT6). * Click here to see the intrinsically safe and explosion-proof items.